Ubisoft Claims Blacklist Trailer Criticism "Uninformed" and "Kneejerk"
Blacklist's director believes that recent gameplay footage doesn't show both styles of play. The recent Splinter Cell: Blacklist trailer certainly drew attention to itself, but not in the way that Ubisoft intended. The trailer, which shows near constant fighting and interrogation, has had some fans up in arms that the series stealth roots might be neglected. Still, other fans were disturbed by how the trailer openly revels in Team America-style jingoism, with the franchise's "Fifth Freedom" taking center stage. Game director David Footman defended Blacklist to Eurogamer, saying that the criticisms are just "kneejerk reactions to a vertical slice of the game" and are "really uninformed as to what the whole experience is like". According to Footman, the car-jumping, neck-stabbing action shown to date is only one side of the game. "It seems to be an overreaction because people are just seeing the 'pow! ', the explosiveness... There are two distinct styles of gameplay - you can ghost a map, or you can go wild as well. There are some areas you'll have to play stealth, but there are areas where you'll find it hard if you don't use wide-open action." While the trailer seems to focus on a black-and-white action experience, Footman is quick to emphasis that Blacklist will play in the grey. "If it makes you squeamish and uncomfortable, maybe that's the point... We feel it's an interesting dilemma for the player." 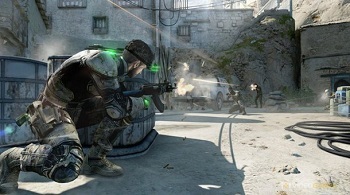 While the series underwent significant changes during 2010's Splinter Cell: Conviction, Footman states that evolution is necessary to compete today. "If you want to come out with a big Hollywood movie in the summer time, if you're not a big blockbuster - you're not going to get seen." Ubisoft doesn't want to abandon the core of the franchise, but as Footman notes, "like every branded franchise, it is evolving." What he seems to be saying is that Ubisoft's current PR misrepresents the game, while also blaming fans for reacting to it. Perhaps what they really need to do is get the game into the hands of players so they can find out for themselves. Footman agrees: "We really need to get a demo out there".